Never considered to be the best of the three books in Suzanne Collins’ original Hunger Games book trilogy, Mockingjay was always going to be handed the difficult task of wrapping everything up in a comfortable and satisfying manner. After all, how does one conclude the adventures of Katniss, Peeta et al without neither alienating the fans that made it so successful in the first place nor betraying the core political stance it had become synonymous with? The answer is, not easily; and that stretches to the book’s two-part film adaptation too. While The Hunger Games: Mockingjay – Part 1 was fine enough as an intelligent, if action-lite, political thriller masquerading as a YA movie, Part 2 is undoubtedly burdened with the trickier task that plagued its source material – but there is enough material here that can give fans and audience members the right amount of satisfaction when saying goodbye to this particular world and characters. As for our opinion? That’s a slightly different story. Picking up from pretty much where we left off, with Katniss Everdeen (Jennifer Lawrence) recovering from an unprecedented attack by the brainwashed Peeta Mellark (Josh Hutcherson), the rebellion is starting to unite all the impoverished Districts at last thanks to Katniss’ actions as the symbolic Mockingjay, and a final assault is planned on the Capitol – which has been placed with booby-trapped “pods” around every single corner, a major hurdle for Katniss and her covert team – and, ultimately, against the tyrannical dictator President Snow (Donald Sutherland). However, if the series has taught us anything, it’s that nothing is without a heavy amount of sacrifice, and since this is the final part of the story then expect them to be much heavier this time round, almost to Game of Thrones or, more fittingly, Harry Potter levels. If Part 1 was a political thriller then Part 2 is most certainly a bleak war drama, with exactly as much carnage and uncompromising cruelty as you can imagine – though we suspect, in light of the recent tragedy in Paris, it will be an even more harrowing experience with its endless bloodshed and gunfare in a city doubling as a warzone (a heavily unfortunate case of bad timing; not the film’s fault by any means). Director Francis Lawrence, who has now been at the helm for all the Hunger Games movies bar the first Gary Ross-directed one, once again does a good job of making this world seem more real than it actually is, with the dodgy back-door politics and heavy reliance on the power of media being as savvy and timely as ever. As for the other major Lawrence of the franchise, the actress delivers an extremely passionate performance that grows into something much more intimidating as her patience and tolerance on both sides of the rebellion starts to run out. It’s a strong performance to close out the character and series that made her a worldwide phenomenon. Everyone else does good as well, with Hutcherson in particular being memorable as this poor guy who’s a good and likable fella but has been severely corrupted and brainwashed to a point where it’s actually rather terrifying. Big names like Woody Harrelson, Julianne Moore and especially the late Philip Seymour Hoffman – this being his final performance before his death mid-way through shooting – aren’t blessed with as much to do as their younger co-stars, and you get the impression that Part 1 offered their characters’ strongest moments more than the epic finale itself. Will this movie satisfy fans of the books and films, as well as any other audience members who have gone through the previous few films? To an extent, yes. From what we know about the book Mockingjay, both parts follow it fairly close to the letter, with certain events either being scaled back significantly or gone into much more detail, and it seems to be a reasonably faithful adaptation despite the book being considered not the highlight of the series. For us, we definitely liked it; but at the same time, we feel that it’s definitely not the strongest of the film series (that honour, in our opinion, goes to Catching Fire) primarily because it moves at more of a snail’s pace than the other films. It takes a good while for things to actually become gripping, with a lot of the middle chunk of the flick being dedicated to the mission within the booby-trapped Capitol and even that takes its time to get truly moving. We get the impression that both Mockingjay parts are the Deathly Hallows movies in reverse; whereas the first Mockingjay seemed to move quite quickly and getting more to the point, the second feels more like an extended road trip with several scenes of characters sleeping and waiting whilst on the run. Maybe we were just expecting a bit more from the final part in what is overall a good series, but we didn’t feel as satisfied as many others probably will be. 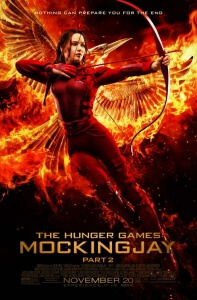 For what it is, it’s still better than many other YA adaptations that try and fail to recapture the magic; but The Hunger Games: Mockingjay – Part 2 ends the series on a muted bang when it could have been an awe-inspiring fireworks display. 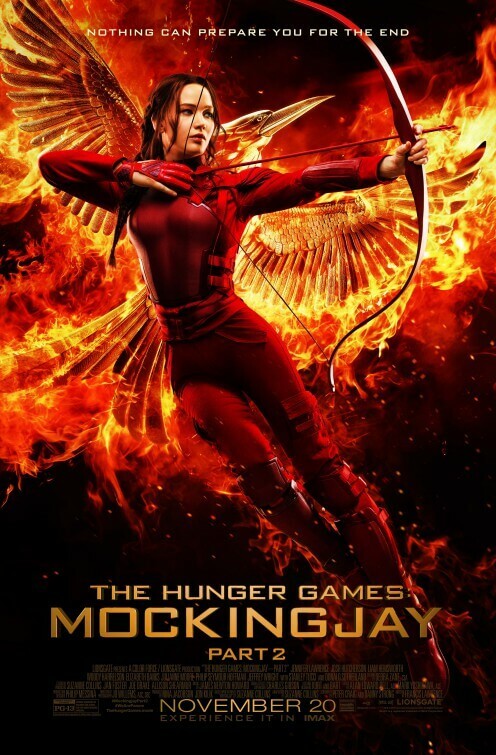 The Hunger Games: Mockingjay – Part 2 will serve as a fine conclusion to fans of the books and films, but it may come as a slight disappointment to anyone expecting more of a satisfying finale to what is ultimately a strong YA franchise.